Hi. I’m the author of Sage & Smudge: Secrets of Clearing Your Personal Space. My best-selling booklet was published 13 years ago and has helped tens of thousands of people clear their themselves, objects and, most importantly, their personal spaces. 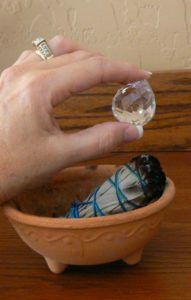 Here you will find additional “How To” articles on space clearing using this Native American method called smudging. Is there negative energy around you? Many people have been affected by negative energy in their home or workplace. Negative energy can drain your vitality, leaving you depressed and feeling ill. It can cause difficulties in relationships and at work. It can stop the good things from coming to you. You can tell a house that’s afflicted with negative energy. The house is harder to maintain, things seem to break more easily. When you try to repair things workmen don’t show up, or they do a substandard job. Sometimes the home gets infestations of insects or rodents. There maybe crime that happens to the home and residents; break-ins or vandalism is quite common, and crime starts happening more frequently in the neighborhood. Houses with negative energy are very hard to sell. They sit waiting for a buyer as the owner’s lower the price over and over. How did the negative energy come to be in your house? Negative energy can come from a lot of sources. There may have been a lot of stress or unhappiness in your life before. This energy can build up and start to manifest as negative energy in the house. It can be one person in the house who is unhappy or destructive to themselves or others that attract the negativity. The previous owners or tenants may have suffered great losses or had periods of distress and uncertainty. When you moved into the house that energy was already there. If there’s a lot of loneliness or longing you can attract ghosts. Some of these spirits can be quite negative and troublesome. It can be related to your work. If you’re a healer, a nurse or therapist you help people release pain and suffering everyday. And some of that energy can follow you home and build up in certain areas of the house. Smudging is the term for when we clear a space using sage. Burning sage clears the room of the negative energy and brings positive energy into the home. Sage can be used in several forms. Many people use Smudge Sticks, bundles of dried sage leaves tied together with colored string. Loose Sage is also used. Taking some sage leaves and burning in a fireproof bowl is also effective. Sage can also be combined with other herbs when very specific clearings are needed. Sage and Lavender, Sage and Cedar, Sage and Juniper, and Sage and Sweet Grass are popular combinations. Smudging can be done in a room or office. You can also smudge a person to clear them of negative they may have picked up from another person or a place they’ve been. And you can smudge objects. Do you have a piece of jewelry from an old relationship (one that had an unhappy ending)? Do you have a piece of furniture that you picked up at an antique auction or found at a yard sale? Do you have a crystal you’ve been using to protect you or to draw energy that doesn’t seem to be working anymore? These are just some of the things you can clear with sage. The White Sage Wand she is holding is about eight inches long and almost two inches around at its thickest point. The wand is tightly wrapped at the base with brightly colored thread. The thread has been wound in a pattern that continues up and around the Sage twigs and leaves, the entire length of the wand. It has helped to bind the Sage leaves firmly in place as they dried. She holds that brightly bound base of her wand now firmly in her left hand as she lights the top of it with her lighter and watches the flames burn hungrily for a few moments as they ignite the dried White Sage. Then the flames recede to an even glow, as the Sage wand and she become ready to do the clearing work. Smoke rises from the wand into the air with every move she makes – dancing with the movement of the air in the doorway where she is standing. Placing the lighter in the pocket of her vest, she picks up a small ceramic bowl. She will use it to catch any ash that might fall from the wand during the process of her clearing ceremony. She glances quickly around to check that the matching ceramic pot with sand in it is placed outside the entrance-way to the room she is about to clear. And then she turns her attention to the process of clearing her personal space. As you read this introduction to a Sage and Smudge ritual, you have an image of a woman who is about to take charge of the energy in her environment, to clear it from any negativity, and to call in supportive and helpful spirits (angels or other spiritual essences or representations she believes in) to clear, protect and heal her personal space. In a way, you are “watching” someone involved in “active prayer”. This is the most common way individuals use the process of their personal Sage and Smudge Rituals – to talk to their God, the Essence of Good they believe in, and ask for support and protection in the course of their daily lives. The use of herbs for healing and to enhance well-being was a common practice in the past, and still is part of the lives of many people in every culture today. Burning herbs for their pleasant aroma is a very ancient practice. Down through the ages man and women have sought to call the attention of their gods to an offering or a prayer they make. The image of smoke rising towards the heavens is symbolic of their prayers rising to the ears of their gods. In ancient Babylon, in the temples of Egypt, in the various Mediterranean religious centers, in Ancient Greek and Roman religious ceremonies, in the days of Abraham and the prophets of the Bible and the wandering tribes of Israel, among the Celts and the Ancient Britons and the Vikings, people burned offerings to their gods. All believed that the smoke rising into the heavens called these gods’ attention to the prayers of their believers. In other parts of the world, China, North and South America, Africa, India-each culture had its rituals and ceremonies, and each of them believed in the power of sacred smoke to lift their prayers into the heavens. Our own culture has its roots in these ancient customs and the beliefs that were carried from one part of our world to another by the powerful nations and religions of the past. Each time a nation met another nation, whether for purposes of battle or trade, they came into contact with each other’s beliefs. Prayers, blessings and offerings were observed; customs and practices of the different societies and individuals were tested by each. Any parts that fit with what either society believed were incorporated into their own practices, eventually becoming part of their ceremonies and rituals. In our times, the use of burning incense, or smoke rising from the altar in some form, is still part of all of the major religions’ practices. Many other less mainstream spiritual groups have incorporated the use of herbs in various ways into their practices, their rituals and ceremonies. Even those who do not follow a particular form of religious observance enjoy the customs of the culture they live in, the herbs and the scent of the “perfumes” of our earth. Many “pray” in their own way, or wish, or hope or believe that some form of positive thinking can help create the future they envision. Use this book like you would any guidebook, to create your own sacred smoke rituals. You will find tips on how to select Sage and Smudge herbs and a variety of sacred smoke “tools” commonly used in personal ceremonies and rituals. Use all of this information to enhance your spiritual and metaphysical connection to your Universe, to the Power you believe in. Find out how to cleanse negative energy and clear your personal space. Heal your relationship to the world you live in and share with those you love. Use any of the ceremonies described in this book to enhance your own focus on the issues in your life, on your “prayers”, your vision, your hopes and your wishes. Empower yourself by creating your own rituals and ceremonies as you become more familiar with the benefit of personal Sage and Smudge rituals for clearing and healing your personal space. Copyright © 2003 by ETC Publishing. As you are learning how to smudge you will also want to know when to smudge. As smudging clears negative energy you want to smudge whenever you suspect that the energy is not so positive. But smudging is process and takes time so you want to pick the optimum times to clear your space or yourself. Smudging should be done at certain times and then can be done when needed. When you move in: When you start at a new house or apartment the space contains the energy of the previous occupants. If the house is newly built then it contains the energy of the workmen. All residences carry some energy from the land itself. This is harder to clear especially if something truly horrific happened in the location in times past. But as long as you’re not on some ancient burial ground then most of the energy you are feeling are from the home itself. I suggest you smudge as soon as you move in, even before you sleep there your first night. If this is not possible then smudge as soon as you can to clear away the negative energy that may have been left by the previous owners. When someone in the home has been ill: The energy of illness can persist in a house even after the person has recovered. Doing a clearing with sage especially in the bedroom and bathroom used by the sick person can help “heal” the energy of the whole house. When a guest in the house has been negative, unhappy, or ill: Sometimes even a visit from a person who is ill or emotionally out of balance can throw off the balance of the home. When this happens clear the place as soon as they leave. Pay attention to the entry they used and places they sat in the house. If you don’t want the person to return then when you finish smudging stand at the door and “tell” them they cannot return. When you come home after a bad day: Some colleagues and I had some offices years ago where we would see clients and help people through some trying times. There was one spot in the office where every client seemed to focus on and release what they were carrying. It didn’t take long for negativity to gather in that one spot. If you come home after a long day and come through the garage door into the kitchen and see a pile of dirty dishes you might lose your temper. If you see that day after day and you get angry over and over a spot of negative energy will form and this will throw off the energy of the house. If you have a difficult neighbor: Sometimes we have a neighbor we just can’t seem to get along with. This can set up a vulnerability for negative energy to come into that house from the side the neighbor is on. After smudging the house to clear the energy you may want to find a protection remedy through Feng Shui like a Bagua Mirror to protect your home in the future. On the New Moon: About once a month the Moon disappears for an evening. This is the new moon and it marks a new beginning for the month. By smudging and clearing the space at this time you will be setting the energy to welcome in new opportunities and new money. On the 1st day of the Month: While not as powerful as smudging on the New Moon it still works to smudge on the first day of the month. This will help give energy to your monthly goals and focus your energy towards the positive. Clear furniture you get at yard sales or from antique dealers: The things you bring into your home will have the energy of the previous owner and when you choose something that has been discarded, no matter how good a deal it is, it could have negative energy. This energy can be released into your home affecting your prosperity and your relationships. It’s a good idea to smudge furniture when you get it, especially used furniture. Jewelry from past relationships: You may have some keepsakes from a previous relationship, one that may not have ended so well. Don’t let the energy of those rings, pendants and earrings contaminate your current relationship or your search for someone new. Make sure, if you’re going to keep the item, that you clear it using sage. If you need help with space clearing or are interested in Astrology or Feng Shui you can have a private session with Donna Stellhorn. Click below to find a time that’s convenient for you. Once you schedule you will be contacted about what you are looking for in a session. There is no payment required at this time. If you have questions or are curious go ahead and schedule a time.